This Steamed Rice Cakes (Banh Bo Hap) recipe is from my childhood and conjures up so many happy memories. 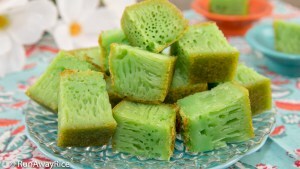 Known by a few different names, Cow Cakes or Steamed Honeycomb Cakes, the cakes are sweet, soft and deliciously spongy. As a young child, my sister always called these “Cow Cakes” because “Bánh” in Vietnamese means “Cake” and “Bò” means “Cow”. My Mom would laugh and explain to her that “Bò” also means “to crawl”. That’s what the batter does when it’s steamed–it “crawls” upward rising into a puffy cake. My sister’s nickname for this cake stuck in our house. Moving to southern California, I was pleasantly surprised to also hear others call them “Cow Cakes”. Depending on whom you ask, you will definitely get different explanations on the name. Recently I read on Wikipedia the word “Bò” is intended to mean “Cow” as the cakes resemble a cow’s udder. Well, that I don’t really see. Call them what you will, these cakes are scrumptious and pretty easy to recognize. They are sweet, soft and moist and when cut open have honeycombs throughout which give the cakes their interesting spongy and light texture. 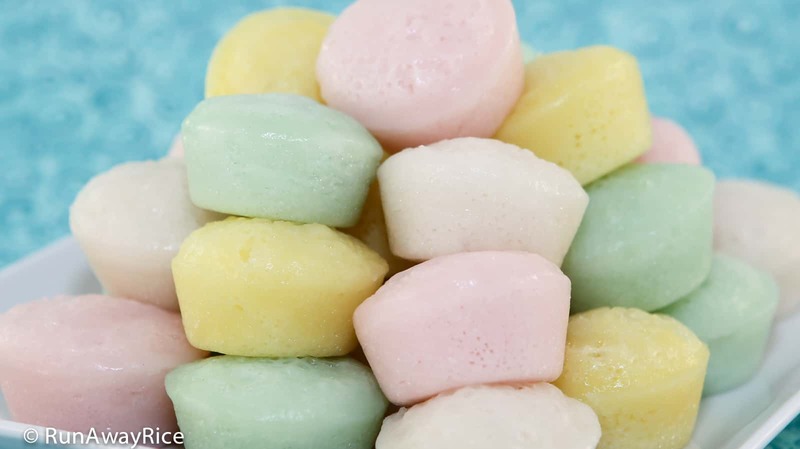 The Viet version of these cakes are small and they are usually enhanced with food coloring (green, pink, and yellow) for eye-catching appeal. 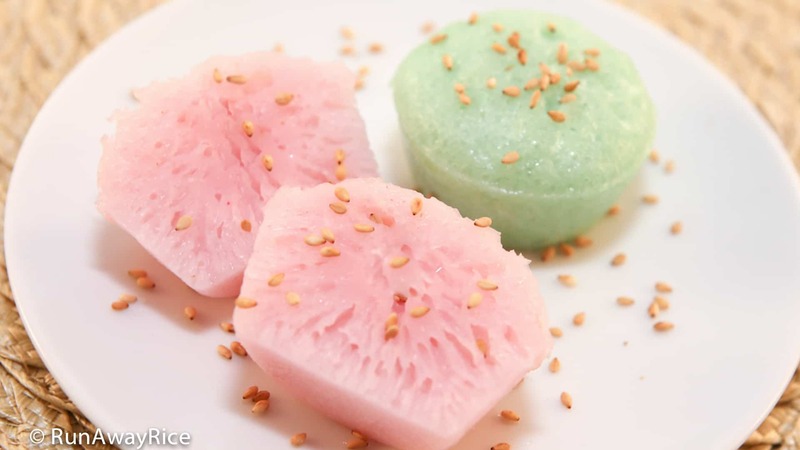 Steamed Rice Cake is a wonderful dessert everyone should learn to make and it’s not as difficult as you may think. There are some key techniques to learn but once you get them down, you’ll see it’s easy peasy. Please watch the video, read the recipe along with the tips and tricks and follow the directions closely. Good Luck! Use fresh active dry yeast. Activate the yeast using warm water that is approximately 100 degrees. If the yeast isn’t frothy after resting for 10 minutes, the yeast has expired. During the colder months, the batter may not rise as quickly. To encourage the batter to rise, place the bowl in the oven with the light on and close the door. The light will generate additional heat and further activate the yeast. During the summer months (air temperature in the 70’s), letting the batter rest on the kitchen counter is just fine. Use liquid or gel food coloring. Gel food coloring requires lots of mixing. Be sure to mix it into the batter evenly so there are no streaks or blotches of color. When adding food coloring, keep in mind the colors brighten when the cakes are steamed so go easy on the food coloring and don’t add too much. Since the batter is near the warm stove, you may notice bubbles forming on top of the batter. Use a spoon or skimmer to scoop off the bubbles and discard. These bubbles make the tops of the cakes uneven and bumpy. As flour has a tendency to settle in liquid, be sure to stir the batter several times before pouring into the pan or dishes. When preparing the steamer, fill the bottom pan with plenty of water, about three-quarters full. The steam needs to be strong and steady when cooking these cakes. The goal is to steam these cakes quickly over High heat. Having two sets of mini-muffin pans is best. As one batch is cooling you can start steaming another one. You’ll be able to make the cakes quickly. As an alternative to using mini muffin pans, use any small dishes or cups. Try to keep them about the same size so they are done steaming at the same time. To test for doneness, insert a toothpick into a cake and if it comes out clean, it’s done. The mini-muffins steam for 6 minutes. Adjust the steaming time according to the size of your dishes or cups. Be sure to steam the empty muffin pan or dishes before adding the batter. The hot pan or dishes will help the batter to rise and make the cakes fluffy. Wrap a large kitchen towel around the steamer lid to absorb the moisture. This saves time as you don’t have to continually wipe the lid as the cakes are steaming. If the moisture from the lid drips down onto the cakes, little blisters may form on the cakes. Also, water drips from the lid could affect the consistency of the cakes, making them wet. Consider using your wok to make the Steamed Rice Cakes if you don’t have a steamer large enough to hold a mini-muffin pan. 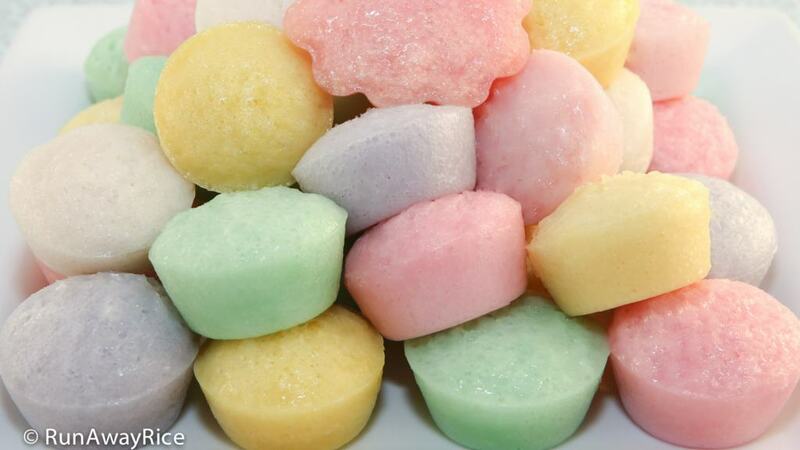 Store any Steamed Rice Cakes not eaten within the day in an airtight container and refrigerate. 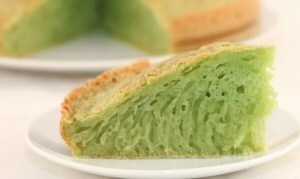 Warm the cakes in the microwave for 15-30 seconds or steam for 1 minute. 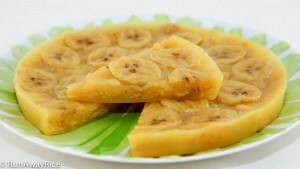 Enjoy the Steamed Rice Cakes within the week. Heat 1/2 cup water to approximately 100 F (38 C). Add the active dry yeast and sugar and stir together. Let the mixture rest for 10 minutes or until it becomes frothy. In a large measuring cup or bowl, combine the sugar, vanilla sugar, coconut milk and remaining 1 cup water. Whisk together until the sugar is dissolved. Microwave the liquid on High for 1 minute. Let the coconut milk mixture cool until the temperature is approximately 100 F (38 C). Pour the coconut milk mixture into the batter and whisk together combining well. Strain the batter. Pour the batter into 4 separate cups or bowls, approximately 1 3/4 cups in each. Add your choice of food coloring to each batch. Let the batter rest for 30 minutes. Fill a steamer basin three-quarters full with water. Cover and bring to a rapid boil over High heat. Using a small brush, lightly oil each of the muffin cups with vegetable oil. Place the empty mini-muffin pan into the steamer tray and steam for 1 minute. Stir the batter a few times and then pour the batter into the muffin cups filling each cup almost to the top. (Leave some room so the cakes can expand and rise.) Cover and steam the cakes for 3 minutes. Remove the steamer lid and wipe off the moisture with a kitchen towel. Replace the lid and steam for another 3 minutes. Remove the mini-muffin pan from the steamer. Allow the Steamed Rice Cakes to cool for 5 minutes before removing from the pan. A simply and delicious way to serve these cakes is to drizzle them with creamy coconut sauce and then top with roasted sesame seeds. Refrigerate any remaining portions for up to 1 week. To reheat, warm in the microwave. 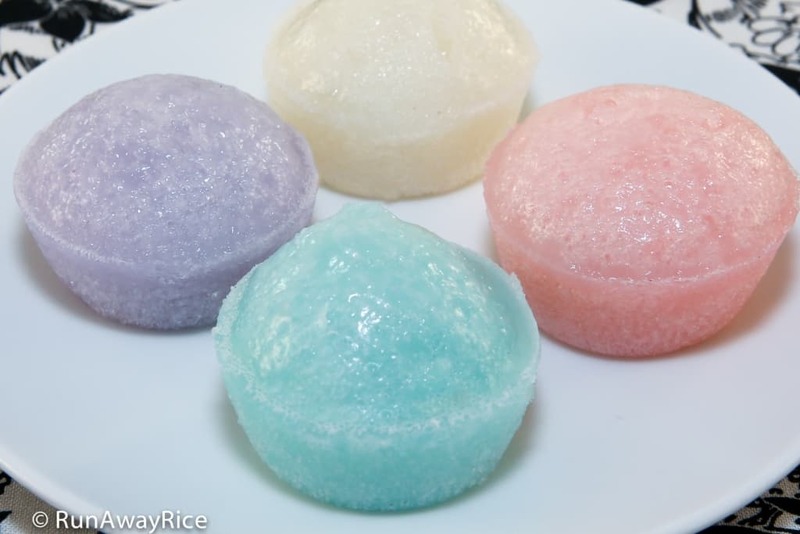 This Steamed Rice Cakes (Banh Bo Hap) recipe is from my childhood and conjures up so many happy memories. They are sweet, soft and moist and when cut open have honeycombs throughout which give the cakes their interesting spongy and light texture. 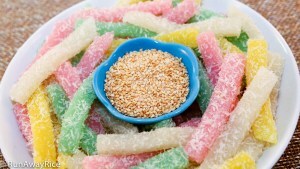 The Viet version of these cakes are small and they are usually enhanced with food coloring (green, pink, and yellow) for eye-catching appeal. During the colder months, the batter may not rise as quickly. To encourage the batter to rise, place the bowl in the oven with the light on and close the door. The light will generate additional heat and further activate the yeast. During the summer months (air temperature in the 70's), letting the batter rest on the kitchen counter is just fine. Use liquid or gel food coloring. Gel food coloring requires lots of mixing. Be sure to mix it into the batter evenly so there are no streaks or blotches of color. When adding food coloring, keep in mind the colors brighten when the cakes are steamed so go easy on the food coloring and don't add too much. Having two sets of mini-muffin pans is best. As one batch is cooling you can start steaming another one. You'll be able to make the cakes quickly. As an alternative to using mini muffin pans, use any small dishes or cups. Try to keep them about the same size so they are done steaming at the same time. To test for doneness, insert a toothpick into a cake and if it comes out clean, it's done. Wrap a large kitchen towel around the steamer lid to absorb the moisture. This saves time as you don't have to continually wipe the lid as the cakes are steaming. How much vanilla extract would i use to substitute for .28 oz of vanilla sugar? Use 1/2 tsp vanilla extract + 2 tsp sugar = .28 oz vanilla sugar Good Luck! You don’t need a special steamer like the one I have to make these yummy cakes. If you have a large pot or wok with a lid and a steamer rack, you can use it to steam on the cook top. I’ve never tried using the steam function in the oven. Unfortunately, my oven doesn’t have this feature. Let me know if you have another questions. Good Luck! The only ? I have was . Can I use Vanilla Extract instead Vanilla Sugar? Yes you can substitute vanilla sugar with vanilla extract. Enjoy the recipe!